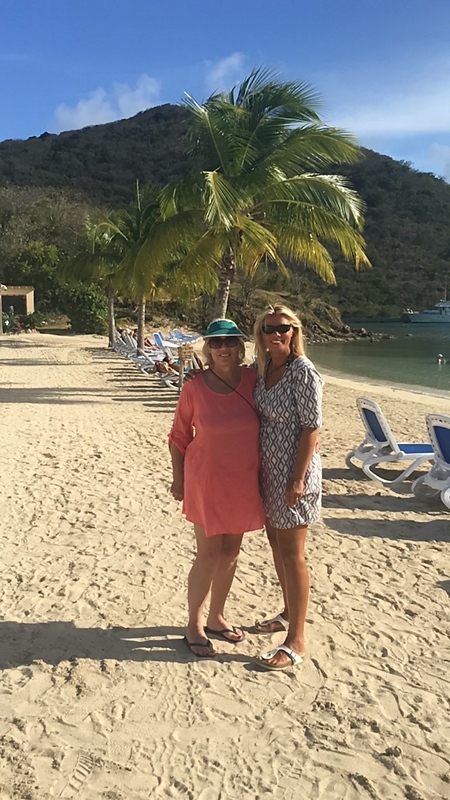 We arrived 4am our time – a bit weary, mostly from immigration queues in both Antigua and Tortola, but very excited to quote “Private Yacht Askari” on our immigration form and even more excited to see our Skipper, Andrew, waiting for us as we finally exited the airport at Beef Island. A brief stroll down the beach from the airport - yes, really! There was the dinghy, Askooby, waiting for us. 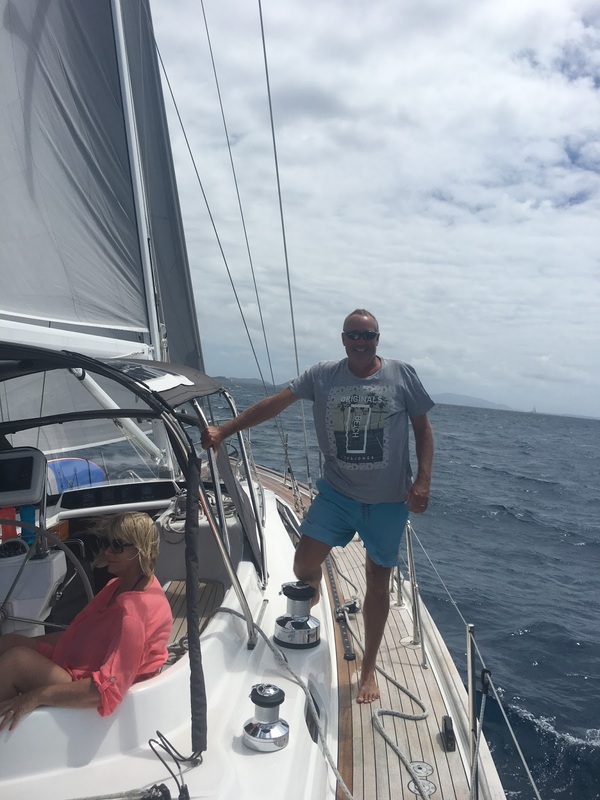 A quick ride out to the mooring in Trellis Bay and we were finally aboard! We woke to less sun than expected, but very warm as we motored past Bellamy Cay into Camanoe Passage and anchored off Lee Bay for breakfast. We then sailed on past Guana Island across the bay to Green Cay and Sandy Cay, a cute little desert island complete with palm trees where we snorkelled off the boat before sailing back across to Tortola and through a cut at the bottom of the island into Soper’s Hole, a very deep and well protected harbour in the West End of Tortola. 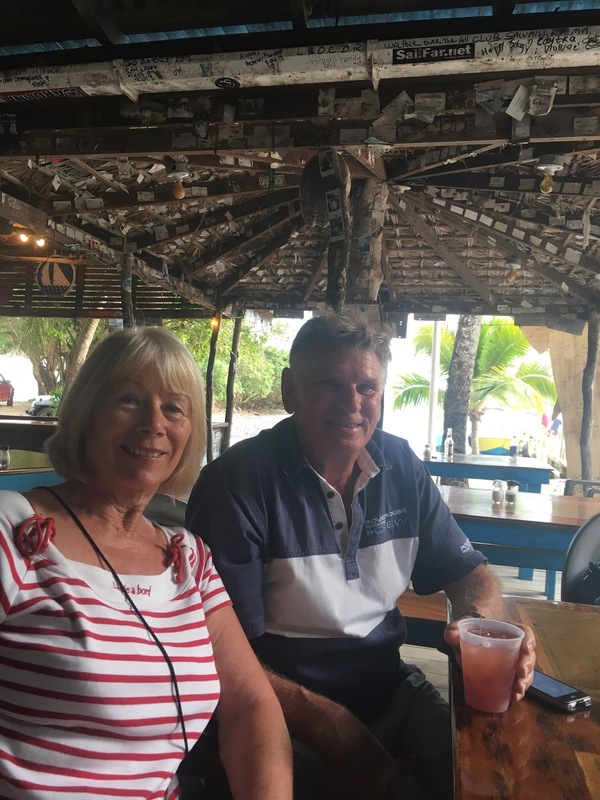 Carolyn and Andy have joined a Rally Group for their passage north to the US and we met the leader of the “Salty Dogs” for drinks on board their yacht. After a pretty wet and windy night we went ashore for a walk and brief explore, fascinated by the mud crabs at the water’s edge. Having skirted the harbour we found Pusser’s Landing a local chain of shops and restaurants catering for the yachting community. Carolyn had spotted a better mooring further in the harbour as we walked round, so went back to Askari to help move her. We stayed ashore exploring this interesting two storey emporium, selling so many branded goods and a huge range of frozen food, etc. We had our first ‘painkiller’ cocktails, a heady mixture of rum and fruit juices, which helped us sleep through the rain and wind squalls punctuating the night. 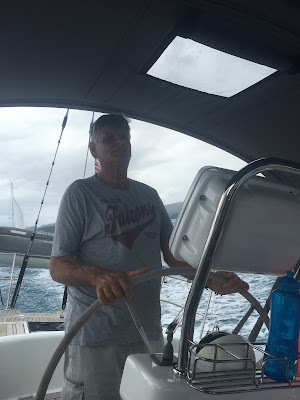 Despite the grey morning, the forecast was better and we had a great sail from Soper’s Hole back through the cut across to Joost Van Dyke Island, really appreciating the ease with which C&A can reduce sail and handle the boat in quite tricky conditions. Askari sails like a dream, pushing through the swell and never being stopped by the waves. As we approached a mooring buoy we could see another squall approaching, so ducked under cover as Andrew and Carolyn dealt with the mooring lines, etc. The sky cleared and we went ashore for lunch in Corsaires, one of the beach bars along the front. 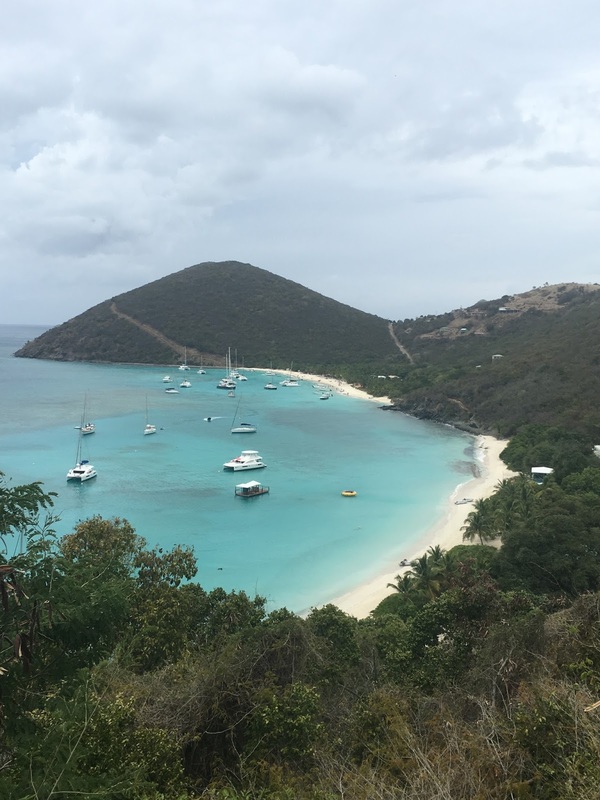 We went for a hike over the hill to White Bay on the other side of the island with the most beautiful crystal sapphire water. Drinks in Ivan’s Bar on the beach, decorated with sea shell plaques, some created by a friend of C&A from Australia. Back to Askari to get cleaned up, we went ashore again for sundowners in Foxy’s Bar, apparently a must do place in the BVI’s, more ‘painkillers’ and a very sociable evening with crew from other boats. 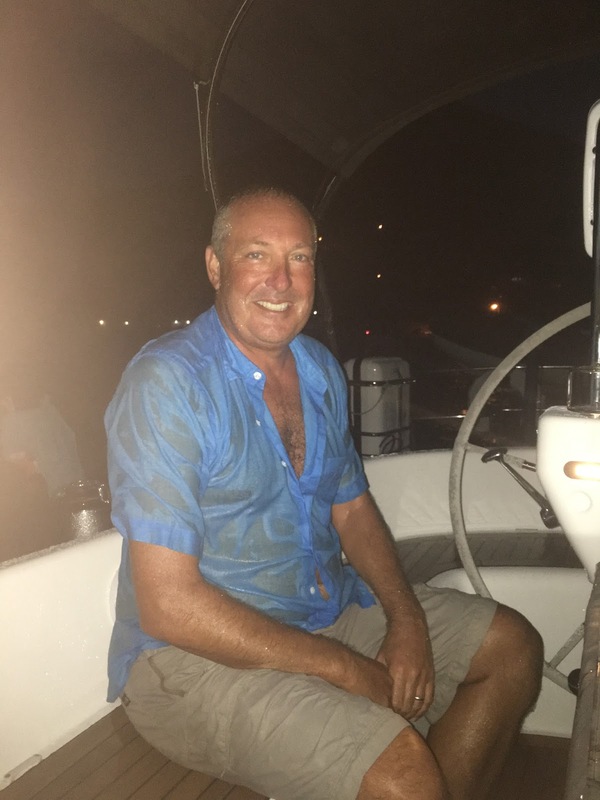 Unfortunately a squall came through as we motored back and we were all totally soaked through by the time we got aboard, but it was pretty warm rain and Askari boasts a washing machine and tumble drier!! What luxury! Another grey morning after a fairly squally night, but we left the Island and tacked across the bay back towards Tortola and through the gap again at West End – United States on one side – British Territory on the other. A really fabulous sail up the sound to Norman Island. After picking up a buoy C&A went off snorkelling whilst Andrew and I enjoyed some quiet time sunbathing on the beach. The big attraction on this island was Willy T’s, a pub on a boat! It was really something else, with folk arriving for sundowners by dinghy, paddle board, canoe or even just swimming across the bay. Very loud music, very strong painkillers and a lot of very inebriated folk enjoying themelves on board. Andrew wanted us to experience where they had snorkelled the previous day and took Askari round the headland where we could drop off the stern of the boat and swim to some caves on the cliff line. What an exciting experience for us. Carolyn had a swim torch so we could see all the colours inside the cave walls, turquoise and pink, as well as the lovely fish. 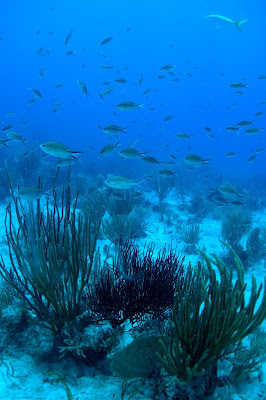 It was like being in an aquarium! 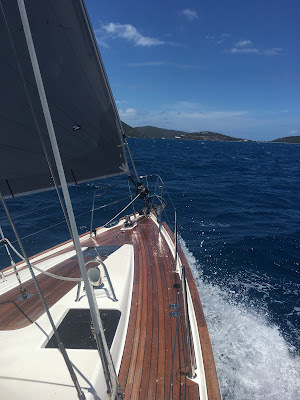 Back on board, we tacked out across the bay to complete our circumnavigation of Tortola Island. We anchored just inside the reef at Marina Cay and had another amazing snorkelling experience, seeing turtles, tarpon and barracuda swimming lazily by. Amazing sunset colours, no rain and a calm night!! Tacked out of Marina Cay into the ocean and sailed out to Virgin Gorda Island, passing Necker Island on the way. Another fabulous sail, passing amazing scenery, all the little islands dotted about with yachts anchored just about everywhere. 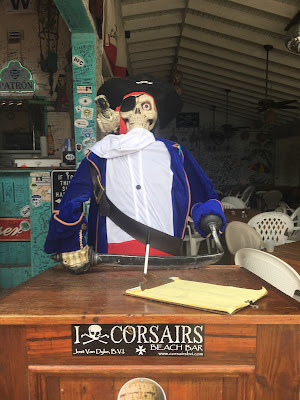 We anchored in Leverick Bay and went ashore for an explore, loving the quaint laid back charm of the place and happy to pay 2.50$ to dispose of our rubbish. We were booked into a Pirate Party with the Salty Dogs for the evening, which gave C&A a chance to meet other cruisers and swop tales, etc. 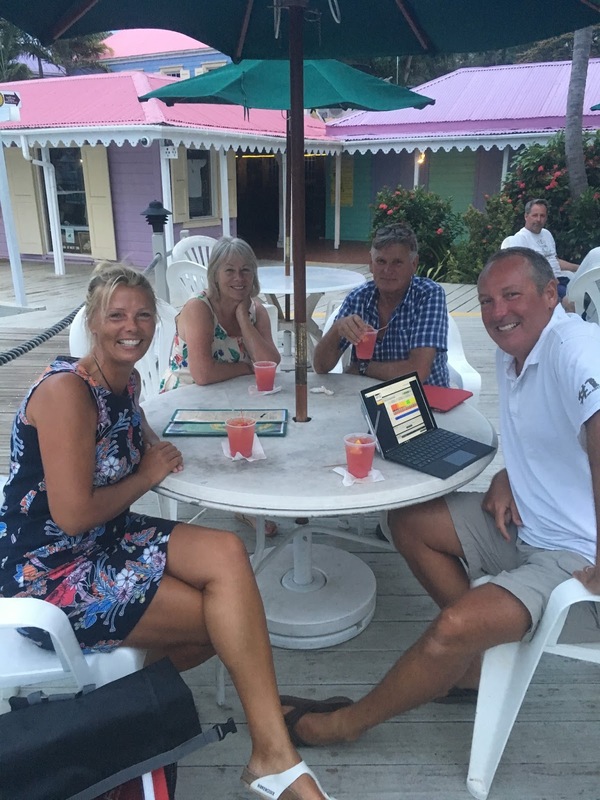 A very convivial evening with lots of cheery folk – nothing to do with the painkillers!! The next day we motored (! 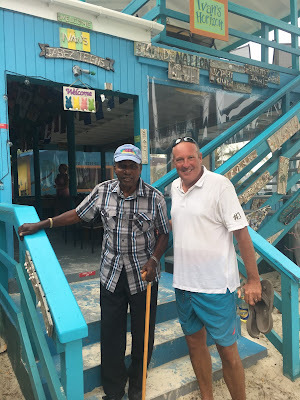 a first) across the bay to Bitter End – another famous Carribean venue. 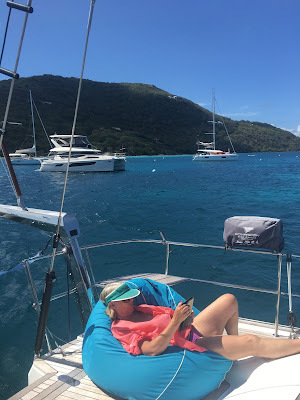 We went out for a reef snorkel and P even managed to get out of and back into the dinghy – not a very ladylike procedure, but who was watching?? Amazing fan corals of beautiful colours and the variety of fish was amazing. Not too happy about the sting rays, but gave them a wide berth. 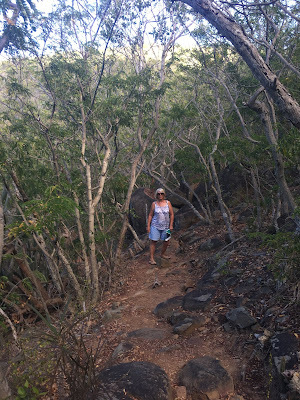 We went ashore for a walk and found Guy’s Trail up to the top of the bay with amazing views out to Necker Island and beyond. The colour of the sea looking unreal – like a painting. Another ‘must do’ venue was Saba Rock bar for tarpon feeding and sundowners, so we went!! Back to Askari for steak and salad bbq on board. What a fab day, with a lovely sunset to boot. 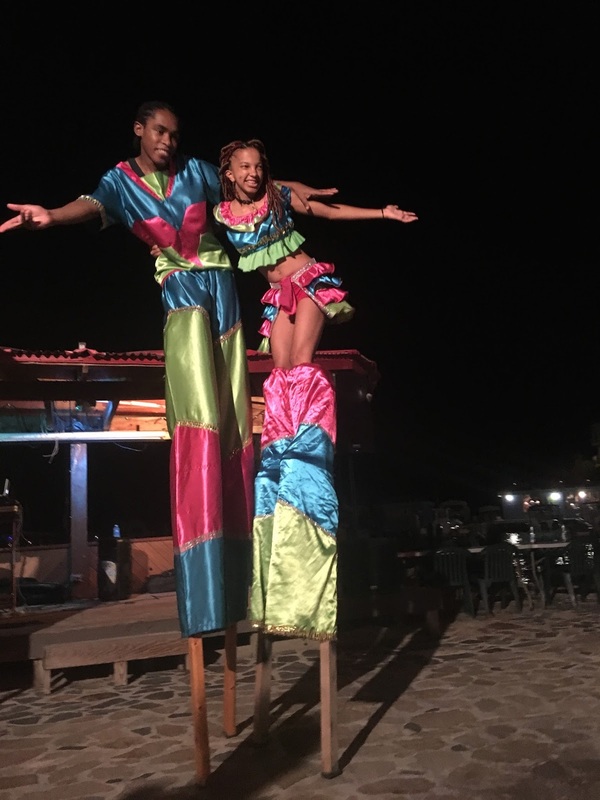 We went back to Leverick Bay for the night and joined in a Beach BBQ party with the Salty Dogs, complete with live music, stilt walkers, etc. a fun noisy night and a hairy ride back to Askari in the dark! 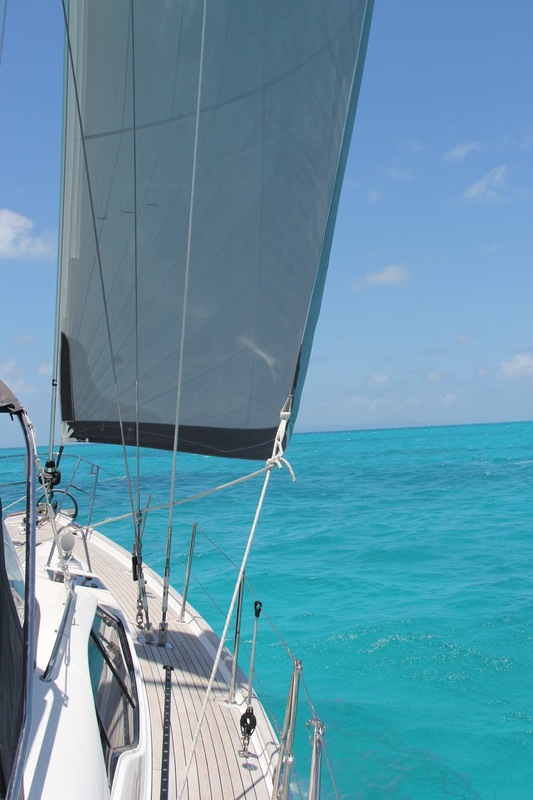 Calmer winds forecast, so a good day to sail out to Anegada Island, a very low lying sand island out in the ocean. Our first beam reach, exhilarating surfing down the swell with speeds on the log we could only dream of with Silver Dawn. A beautiful island appeared on the horizon but very very shallow waters and reef surrounding it. We motored in through the reef and anchored with .1 under the keel! 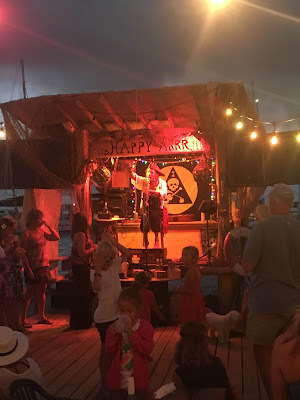 Stayed for a drink and then sailed back across to Virgin Gorda and the comfort of another night at Bitter End – it felt like being home! An early start for us to sail from Bitter End to The Baths, another must do on the tourist trail of the BVI’s, but necessary to get there early to avoid the crowds, which we succeeded in doing. We had to anchor Askari and take the dinghy to a special area and then swim ashore to get to the bay incorporating an amazing geological feature of huge smooth boulder type rocks piled on top of each other. A trail has been formed through them, with amazing postcard views out to sea. We had a gentle downwind sail to Cooper Island and got there in time to find an empty mooring, so C&A could go off for a proper dive. What a wonderful time! Loved the write-up. Interesting blog and I really like your work and must appreciate you work for the BVI keep posting.